October 24, 2014 June 30, 2018 P.O.P. For God’s sake, he talks like the emperor Napoleon… I mean, count the number of times he uses the word I in any speech, and compare that to any other president. Well, unfortunately for Krauthammer and his kind, somebody did just that. The folks at BuzzFeed studied more than 2000 news conferences delivered by all the presidents since 1929, when mass media began coming into its own. 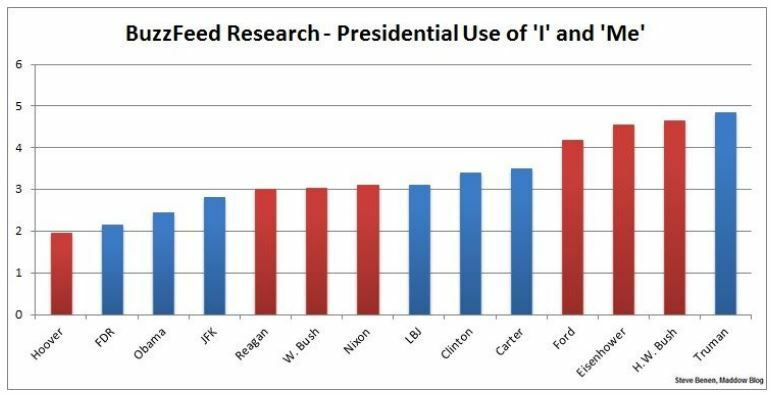 And they counted the number of times the presidents used personal pronouns like “I”, “me” and “mine”, calculated their percentages among all words used, and compiled them into a handy chart. And those results do not speak well for Obama Haters, Inc. Far from having the highest frequency of such pronouns, Obama has to date the third lowest. Furthermore, he also has the highest usage of plural first-person pronouns like “we” or “our”, suggesting that he actually may be the most inclusive of modern presidents. That being said, a glance down this chart indicates that we should exercise caution in assuming that the incidence of such words is always a reliable indicator of narcissism/ arrogance/ self-indulgence. Jimmy Carter is at the upper end of the scale, and he is a manifestly unselfish man who has devoted his post-presidency time to nonpolitical public service. Herbert Hoover is at the very bottom, and yet he was a relentless and unscrupulous megalomaniac who scarcely was capable of doing anything that didn’t advance his ambitions or status. Ronald Reagan also ranks rather low, and yet he had delusions of grandeur that bordered on schizophrenia. 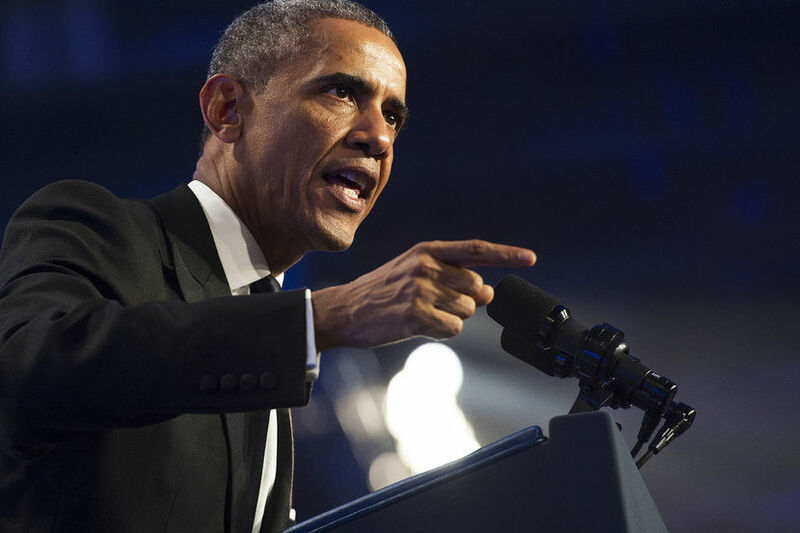 Nonetheless, it’s possible that the haters are, despite their best efforts, on the right track about Obama. His low level of personal pronouns does seem to coordinate with his humility, as reflected in his extraordinary efforts to work with an extraordinarily obstructionist Congress, and his amazing grace and good will in the face of an unbelievable amount of hatred thrown his way. Whatever the implications, the most obvious problem with the haters’ pronoun narrative is simply that they got their facts wrong. Not just mildly wrong, but wildly wrong. And they did so by indulging in that very egocentrism of which they accuse the president. Having heard him say “I” a few times, they concluded, without bothering to investigate, that he does so with great frequency. It’s a folly that has plagued the human race from day one: the presumption that the view from one’s own narrow window reflects what the universe as a whole looks like. And it has resulted in a great many irrational beliefs and behaviors, from the hilarious to the horrific. The belief that the world must be flat because I can’t see it curve. The belief that the earth must be the center of the universe because I see the sun move around it. The belief that the old woman down the road must be a witch because my dog got sick after she petted it. The belief that global warming must be a myth because it snowed in my back yard last week. And now, the belief that the president must be a Kenyan communist Nazi Muslim Anti-Christ because Fox “News” says so. And it’s a folly that likely will continue to plague the human race in the future. Let’s just hope that its consequences are more hilarious than horrific. Previous The 35th Worst President Ever? Next So NOW Election Fraud Is Considered Newsworthy! It does seem that the political right just isn’t satisfied unless they make Obama a whipping boy in response to whatever he says, thinks, and does, and often, for those of us who are still in possession of our own sanity, the most honest thing we can do is laugh outloud. Often when we stereotype or judge, we are engaging in psychological projection–other times we just want to put down some supposedly arrogant prick in their place for the heresy of disagreeing with us, with class— Particularly, its the GOP loves to spread a favorite myth that Obama hates white people and is thus out to thwart the freedoms of anyone with Caucasian blood in their veins. But in reality the President is probably more color-blind in that respect, than the rest of us, since he spent large parts of his childhood in many melting pots around the world–including adolescence among the blended and racially rainbow–like spectrum of inhabitant, living in Hawaii. He has also been exceptionally honest and non-begrudging in his perceptions of humans everywhere, and he probably has spent much of his formative years being unaware that racial issues are even a problem at all! And, despite constantly being lied about (in often hysterical ways), he has been exceptionally even tempered and fair in his judgments. I think it’s obviously that the GOP has more resentments and ill will towards our President, than against most others in the past, presumably just because he tries to do things that they don’t like, and cannot easily be typecast in a politically expedient way. Its a shame also that we waste so much energy trying to nail the other guy to the wall, while we totally ignore the many valid issues desperately should be discussed and debated. All Presidents are criticized for taking too many vacations, too much time seemingly removed from their responsibilities as a leader, or for using tax-payer’s money to finance the use of private jets during times away from Washington. Yes these are probably valid ethical issues but they are quite petty just for the fact that so many Presidents do them–some even more than their predecessors from the opposing parties that they criticize? But what we really need is limits on campaign spending and a return to activities, which will allow for sincere debates about the many very important issues at hand–not whether someone refuses to wear a patriotic pin lapel, or is said to be palling around with terrorists.We have become a nation of petty people, free to be exploited in any persuasive way by manipulative politicians.